Each tablet contains: Folic acid: 400 µg; Vitamin B12: 2 µg; Potassium iodide: 262 µg. Excipients: lactose monohydrate, gluten-free sodium starch glycolate, microcrystalline cellulose, calcium stearate, trisodium citrate, citric acid, maltodextrins. Folic acid is a B group vitamin (vitamin B9). In the body it is converted into tetrahydrofolic acid (THF), an essential coenzyme for the biosynthesis of aminoacids and nucleic acids, whose main role within the cell is to donate and get monocarbonate units, which bind to the 5 or 10 position of the pteridin ring. It is found in all tissues, especially in the rapidly multiplying ones. Folic acid deficiency results in defective DNA synthesis in any cell attempting chromosome replication and division. In the bone marrow, the tissue with the greatest cell division and growth rates, folic acid deficiency causes macrocytic and megaloblastic anemia. Its role in the biosynthesis of aminoacids and nucleic acids makes it a major factor in the development of the CNS, which takes place in humans between days 15 and 28 after conception. Folic acid and vitamin B12 requirements increase during pregnancy mainly due to the growth in both foetus’ and mother’s tissues. Folic acid supplements are better absorbed than natural dietary folates, and it is therefore widely accepted that periconceptional folic acid supplements prevent the occurrence of neural tube defects (NTD). Nevertheless, the biological mechanisms of this protective effect remain somewhat unclear. A direct or indirect involvement in the metabolic pathway of the enzyme methionine synthase is assumed. This is one of the main reactions in the methylation cycle, during which methionine is synthesised from homo-cysteine in a reaction catalyzed by methionine synthase, an enzyme which also requires vitamin B12 as co-factor. The conversion of 5-methyl tetrahydrofolate (5-methyl THF) into tetrahydrofolate (THF) in the body can only occur via donation of the methyl group to homo-cysteine. Thanks to this homocysteine/methionine metabolism, folic acid supplementation can reduce hyperhomocysteinemia levels. Because vitamin B12 acts as a limiting cofactor, its deficiency equally leads to failed activation of folic acid; moreover, vitamin B12 is also involved in folic acid captation by the cell, so that whenever a cell shows primary vitamin B12 deficiency, a secondary folate deficiency, will also show. Vitamin B12 is necessary for DNA synthesis and cell division. It is also involved in lipid, protein, and carbohydrate metabolisms. These functions are thought to be performed by keeping reduced forms of the sulfidryl groups. It is necessary for the synthesis of myeline and in haematopoiesis. Rapidly dividing cells (skin cells, myeloid cells, bone marrow) require large supplies of vitamin B12. 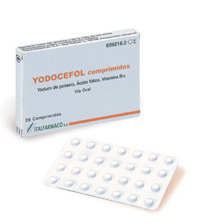 Hence, YODOCEFOL proves pharmacologically active because it overcomes the metabolic block occurring in mothers of babies with neural tube defects. The major Centres for Disease Control and Prevention (USA, UK, and Australia) recommend a daily supplement of 400 µg of folic acid for the prevention of NTD, without exceeding 1 mg daily, which could prevent a diagnosis of vitamin B12 deficiency. The recommended dose of vitamin B12 during pregnancy is 2.2 µg daily. Iodine effects in humans have been characterised in many clinical and epidemiological studies. On the other hand, few animal models are available to demonstrate their mechanisms of action. Iodine is essential for the synthesis of thyroid hormones, thyroxine (T4) and triiodothyronine (T3) accounting for 65% and 59% of their molecular weights respectively. Thyroid hormones are essential throughout all life stages to ensure regular function of the CNS, but especially during its development, since any deficiency of these hormones results in permanent and irreversible functional and anatomical changes in the brain. Iodine is not only the main substrate for the thyroid gland to synthesise thyroid hormones, but it also directly affects specific thyroid functions, as well as cell proliferation. In areas without deficiency, iodine intake ranges between 50 µg and 1000 µg daily and the thyroid function stays normal, with no changes in the thyroid-stimulating hormone (THS). High iodine levels may affect almost every major aspect of thyroid-mediated iodine metabolism. Iodine is able to restrict its own transport. Also, acute inhibition of iodotyrosinase and iodothyronines by iodine is well known. This transient 2-day block is only observed at iodine levels exceeding intracellular – more than extracellular – concentrations. In time, a sort of “leakage” from this block occurs which correlates with a downward adjustment of iodine transport and consequent reduced intracellular iodine levels. Thyroid gland iodine content is usually correlated with iodine intake. In case of large iodine supplements, the thyroid gland may contain 10-20 mg, but in chronic iodine deficiencies, thyroid gland iodine content can be as low as 200 µg. Hence, a rather severe iodine deficiency may affect the synthesis of thyroid hormones for as long as the condition persists, causing hypothyroidism and brain damage. Iodine deficiency is the primary predictable cause for brain damage in foetuses and newborns and for psychomotor retardation in small children. The anti-goitre effect of potassium iodide is due to the inhibition of thyroid protein biosynthesis, which is specifically performed by the thyroid gland. Iodine acts as an endocrine modifier whose main direct effects – in case of excess intake – take place in the thyroid gland, and affects production and secretion of thyroid hormones. Folic acid: Pteroylglutamic acid, i.e. the common pharmaceutical form of folic acid, is directly and rapidly absorbed in the jejunum, whereas polyglutamates - which are the forms found in foods – need to be hydrolysed to monoglutamates by folate conjugase of the intestinal mucosa to be absorbed. The pteroylglutamic acid absorbed during its crossing of the intestinal walls is reduced to THF, which acts by getting different units with a single carbon atom, which are turned into active forms. The resulting THF is the preferred substrate for the polyglutamylation reactions which take place to keep folates within the cell. Pteroylglutamic acid is mainly metabolised by the liver, where it undergoes methylation to 5-methyltetrahydrofolate, which is then released into the portal circulation. 5-methyl THF binds extensively to plasma proteins, carrying them to tissues, and is mostly stored in the liver and the CSF in the form of polyglutamate derivatives. Maximum plasma levels are achieved within 30-60 minutes of oral administration. There is a folate enterohepatic circulation, essential to keep folate homeostasis, by which liver methyltetrahydrofolate is mostly excreted to bile, thus reaching again the large intestine where it is re-absorbed. Once inside the cells, 5-methyl THF serves as a methyl donor to homocysteine in the synthesis of methionine. Folic acid is mainly excreted via faeces and urine. Between 4 and 5 µg in the form of folic acid, 10-formyltetrahydrofolate and 5-methyltetrahydrofolate are excreted daily via urine. An increased folate intake leads to proportional increase in urinary excretion. Unabsorbed dietary folates, folates from bile secretion and from intestinal bacterial synthesis are found in faeces. Part of biliary folates are re-absorbed, so that an enterohepatic cycle is created. Folate also accumulates in mother’s milk. Vitamin B12: Dietary absorption of vitamin B12 is comparable to absorption of vitamin B12 in its crystalline form. Vitamin B12 can only be absorbed if bound with the intrinsic factor (IF), a mucoprotein secreted by the parietal cells of the stomach. The amount of IF in the stomach is a restricting factor for vitamin B12 absorption, irrespective of the vitamin source or amount ingested. This complex is absorbed by a specific factor in the ileum; binding with this factor helps the complex penetrate enteric cells. Once inside the cell, the intrinsic factor undergoes degradation and cobalamin is released and transferred to transcobalamin II into the portal circulation. Transcobalamin I seems to serve as a store for the vitamin with a long 7-10 day half-life, and is apparently not involved in the vitamin captation by tissues or its inter-tissue transport. Transcobalamin III undergoes quick liver clearance, with a 5-min. half-life, apparently providing a mechanism to return vitamin B12 and its metabolites form peripheral tissues to the liver, which is its major storage site. Maximum plasma levels are achieved in 8-12 hrs. Just like folic acid, vitamin B12 also undergoes intensive enterohepatic recirculation. Vitamin B12 has a half-life of about 6 days. The administered dose is partly excreted via urine within the first 8 hrs of administration, but most of it is excreted into the bile. 25% of it undergoes faecal excretion. Vitamin B12 crosses the placenta and is excreted into mother’s milk. Potassium iodide: Iodine is rapidly absorbed. Gastrointestinal iodine absorption is approximately 100%, following intake of water-soluble iodine salts, such as potassium iodide. The mechanism by which iodine is absorbed from the gastrointestinal tract is still unknown. Once absorbed, it is quickly distributed via the extracellular fluid; it crosses the placental barrier and is secreted into mother’s milk. Iodine also reaches other human tissues besides the thyroid gland, which also accumulate iodine, such as the mammary gland, salivary glands and the gastric mucosa. Iodine is mostly excreted in urine and – in small amounts – in saliva, milk, sweat, bile and faeces. Prevention of disorders caused by iodine, folic acid, or vitamin B12 deficiencies in pregnant women during the first quarter of pregnancy and during one month before conception as prophylaxis of neural tube defects and prevention of neurological disorders in the foetus. Hypersensitivity to potassium iodide, folic acid, vitamin B12 or to any ingredient of the pharmaceutical specialty. Potassium iodide is contraindicated in patients with acute bronchitis, overt hyperthyroidism or latent hyperthyroidism if the dose exceeds 150 µg daily. This drug contains potassium iodide, therefore special care must be taken when starting the treatment because some people are hypersensitive to iodine. Patients with hypocomplementemic vasculitis, goitre, or autoimmune thyroiditis are at risk of systemic side effects consequent to iodine administration. Special care should be taken when starting the treatment in patients with renal diseases, hyperkalaemia, goitre or active tubercolosis. Iodides may affect the thyroid gland; administration of iodides may affect thyroid function tests. Do not use iodinated disinfectants on newborns or pregnant women. This drug contains lactose. Administration of this drug should be avoided in patients with hereditary galactose intolerance, Lapp lactase deficiency, or glucose/galactose absorption disorders. - Antiulcer drugs (cimetidine, omeprazole and ranitidine): These drugs may cause reduced oral absorption of vitamin B12, and possibly inhibit its effects due to the change in gastric pH. - Chloramphenicol: In long-term treatments, chloramphenicol may have depressing effects on the bone marrow, possibly antagonizing the stimulating effects on erythropoiesis by Vitamin B12. - Anticonvulsants (phenytoin): Long-term treatments with phenytoin may reduce folic acid plasma levels. Some inhibition of the anticonvulsant effect was also reported. Possible mutual induction of their metabolisms. - Folic acid antagonists: This drug should not be administered together with methotrexate, which acts like a folic acid antagonist by inhibiting the enzyme dihydrofolate reductase. - Fluorouracil: Enhanced toxicity of fluorouracil was recorded, although its mechanism could not be explained. - Sulfasalazine: A reduced absorption of folic acid was observed by concomitant administration with sulfasalazine. - Interactions with other antiepileptics, oestrogens, with the trimetroprim/sulfametoxazole association, with the prolongued use of corticosteroids, and with alcohol were also reported. - Potassium-sparing diuretics: Their association causes a reduced renal excretion of potassium which may result in severe hyperkalaemia (cardiac arrhythmias), or even in a fatal outcome (cardiac arrest), because renal insufficiency is a predisposing factor for this occurrence. If concomitant administration of those drugs is strictly necessary, monitoring of potassium plasma levels and suited dose adjustments are required. In any case, this association should be avoided. - Lithium salts: The concomitant use of lithium salts and potassium salts may cause hypothyroidism, therefore this association should be avoided. Nevertheless, should their concomitant administration be necessary, thyroid hormone may be administered to treat symptoms. - Antithyroid drugs: Association with these drugs may produce an additional hypothyroid effect. Pregnancy: This drug is indicated in pregnancy. There is an increased need for iodine, folic acid, and vitamin B12 during pregnancy. Iodine and iodine-containing drugs in doses exceeding those recommended should only be administered upon doctor’s advice based on assessment of the risk-benefit ratio. Since iodine crosses the placental barrier, and because the foetus is sensitive to pharmacologically active iodine doses, iodine should not be administered in doses of mg.
Lactation: Yodofol active substances are transferred into the mother’s milk. There is poor clinical evidence for its use during lactation, therefore the drug is not indicated in lactation. The following adverse reactions were observed, classified by organs and systems and by frequency. Frequency was ranked uncommon (≥ 1/1,000; <1/100). 1 tablet daily before meals. No particular problems were observed with high doses of folic acid and vitamin B12 other than the possibly expected adverse reactions. These active ingredients can be considered extremely safe to a large therapeutic extent. Administration of potassium iodide in high doses or over long periods of time may cause iodism effects such as metallic taste, burning in the mouth and throat, soreness of teeth and gum, increased salivation, running nose, sneezing, and eye irritation with eyelid swelling. Strong headache, productive cough, pulmonary oedema, as well as swelling and sensitization of parotid and submaxillary glands may also occur. Inflammation of the pharynx, the larynx, and amygdala may also occur. Moderate acneiform eruptions may develop on seborrhoeic areas; severe eruptions are uncommon. Gastric irritation is common with extremely high doses and diarrhoea, sometimes bloody diarrhoea, may occur. Signs and symptoms of iodism usually subside spontaneously within a few days of treatment suspension. Large doses of potassium iodide over long periods of time may cause thyroid gland hyperplasia, thyroid adenoma, goitre, and severe hypothyroidism.